In all of my years reviewing products there is only one that I have loved so much that I actually purchased my own after my sample was thoroughly used up. I was given the pleasure of reviewing Tissue Spritz and I absolutely love it! I love it so much I tell all my friends about it, I have bought bottles of it for my family, and now I’m telling you. You’re probably wondering what Tissue Spritz is, right? Tissue Spritz is a hygienic spray made with aloe vera, vitamin E, and essential oils that you spray on toilet paper in lieu of using flushable moist wipes for yourself or diaper wipes on your baby. Thick diaper wipes and adult flushable wipes are not biodegradable and sit for years in landfills. However, toilet paper is much more biodegradable and you have options for buying recycled brands like Seventh Generation (you can buy it at Whole Foods and other health food markets.) I buy CVS Earth Essentials. 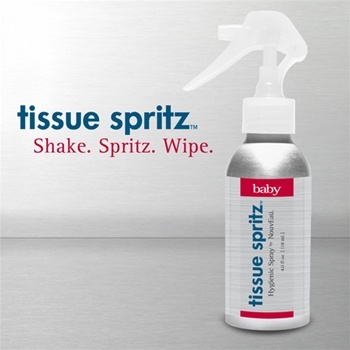 I tried Tissue Spritz Baby as well as the Tissue Spritz Delicato. The scents are heavenly and are extremely natural smelling. Tissue Spritz Baby is a blend of pure water, aloe vera, vitamin E and mild dill and lavender chosen for their cleansing and soothing properties. The Tissue Spritz Delicato is a blend of all the aforementioned ingredients, but uses geranium, lavender, and frankincense instead. I love the modern design of the Tissue Spritz bottles. They look really good sitting in your bathroom and an empty small travel size squirt bottle is incuded in your package that you can take with you when you’re on the go or traveling and you don’t want to bring the big bottle of Tissue Spritz with you. I cannot recommend Tissue Spritz enough. I really, really love it! And they are only $9.95 a bottle so I stock up all the time. 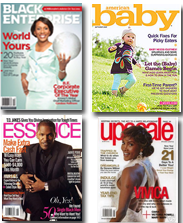 Make sure to sign up for the Tissue Spritz newsletter because they always send timely discounts and coupon codes. TIP: Did you know that if every household in the United States replaced just one roll of virgin fiber toilet paper (500 sheets) with 100% recycled ones, we could save 423,900 trees. Read the Natural Resources Defense Council to read their Shoppers Guide to Home Tissue Products. You can also read GreenPeace’s Recycled Tissue and Toilet Paper Guide.